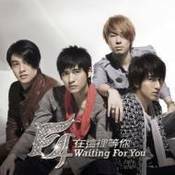 After The Little Tiger's reunion on CCTV's annual Spring Festival Celebration program for their twentieth year, there were rumors and speculation that perhaps F4 would also reunite on the show for their tenth anniversary. While that plan to bring together Jerry Yan, Vic Chou, Van Ness Wu, and Ken Chu didn't fall into place, CCTV gave it one more shot by mailing out formal invitations in hopes that the four would attend the New Year's Eve celebration in Shenzhen on the 21st this year. Alas, Vic thought that the New Year's Eve celebration would actually, you know, be on New Year's Eve (the 31st), and so he had already made vacation plans for the 21st. Unlike in Taiwan, Mainland's CCTV holds their New Year's Eve party earlier. On the night of the 20th, they hold the red carpet event, a press conference, and the dress rehearsal. Then on the 21st, they officially film the show. Had the reunion of F4 been successful, they would have been Taiwan's sole representatives. The "mother of F4", Angie Chai, has deemed it "Mission Impossible" to bring the four together due to their different management companies. And since Vic will be doing promotions in Tokyo for "Black and White" near the Spring Festival date next year, chances are slim that the four will be able to reunite for the occasion. However, it can't be completely written off yet. Perhaps Hunan TV, who has offered to provide them with planes for transfers for Hunan TV's Spring Festival show, will be able to finally bring them back together again. Even Jerry's manager has stated that the four have a consensus on reuniting, but it will all depend on their schedules. In the meantime, we can look forward to other big names coming to the CCTV New Year's Eve party, such as the Four Heavenly Kings consisting of Andy Lau, Jacky Cheung, Leon Lai, and Aaron Kwok.